You guys know what I do, I follow the forum threads and love it when I see a Googler respond to threads. Googlers in forums are generally very patient and overly nice. So when I see a harsh response from a Googler, I do laugh and think to myself, "good going." Especially when the Google response is not just logically right but ethically also. A Google Places Help thread has one business owner upset that his Places listing on Google does not "comply with their terms." If you have a 2,500 mile "service area", you probably don't belong in local search. Only businesses that make in-person contact with customers qualify for a Google Places listing. Anyway, had to share this thread because one, it might be useful and second it was fun. 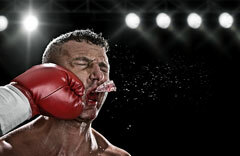 Image credit to ShutterStock for knockout image.